Services – East Coast Prompters, Inc. Contact our knowledgeable crew to discuss specific or customized teleprompter packages for your next production. We also have battery and wireless systems available as part of our packages, which are great for outdoor locations. 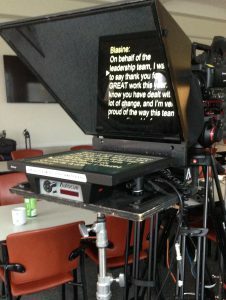 The Standard ENG Prompter is ideal for small corporate shoots, offices, hotel rooms, conference rooms and small studios. Lightweight with a small footprint and easily adaptable to mount on tripod, jib, slider or dolly. Units can be powered with a small battery for remote locations. Accompanied with stand-alone monopod and plate (free standing). Our LED Prompters feature a larger 15″ / 17″ LED monitor for studio, stage or location. Perfect for larger cameras, specialty lenses, multi-camera shoots, larger sets, studios and interratron set ups. Sets up quick and balances easily. Compatible with all cameras and can be powered with a small battery for remote locations. Extra long plate and weights to accommodate long lenses. 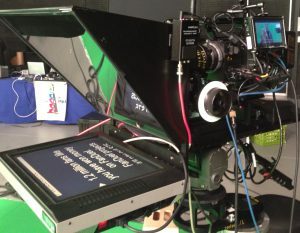 Huge 20″ LCD prompter — the extra-large hood can accommodate a box type lens and large matte boxes. Perfect for larger cameras, specialty lenses, multi-camera shoots, larger sets and studios. Requires a large capacity tripod. Twin podium prompters designed for public speaking, live presentations and corporate events. 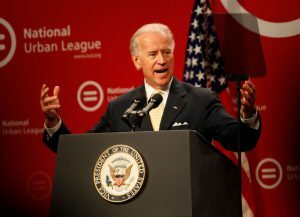 Clear glass positioned to keep the speaker’s eye contact on the audience. Goes in front of the camera and is raised to cover the lens for through the lens prompting without the need for heavy-duty camera support. Can also be used with two cameras side by side behind one prompter so you can shoot your wide and tight shots all at the same time. LCD prompters are independently supported on a monopod stand-alone adjustable stand. 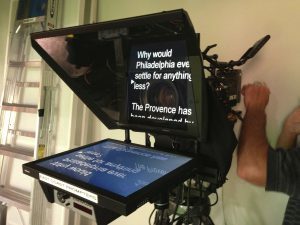 You get the advantages of a large prompter without the need to mount it to the camera. Above the lens option available, battery powered and wireless system available. Specially designed prompter for handheld and stedi-cam work. Smaller heads are also perfect for tighter situations. 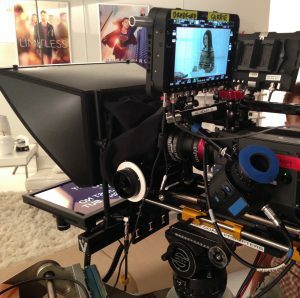 One or more side / satellite monitors on adjustable stands are placed off-camera so it appears the talent’s eye line is looking at the interviewer. Great for an interview that needs to be prompted with script, bullet points or Power Point. Additional monitors and stands are available. Use a pair for cross-talk or role-play dialogue. A creative interview method developed by filmmaker Errol Morris where live video feeds of the faces of the subject and interviewer are displayed on teleprompters instead of text. The effect is that the subject looks directly into the camera lens, while at the same time, engaging in eye contact with the interviewer. Here’s how it works — A teleprompter is put on the main camera (pointing at interview subject). A second camera is set up pointing at the interviewer. A second teleprompter is put on that second camera. The video feed from the main camera is displayed on the interviewer’s teleprompter and a video feed from the second camera is displayed on the subject’s teleprompter. The effect is that the subject and interviewer make virtual eye contact with each other through the teleprompters. Sometimes it’s not possible to know what your production day will throw at you. At East Coast Prompters, we have your back covered. All of our operators carry backup gear with them or standing by in their vehicles, such as computers, monitors, stands, head units and extra glass. If there’s a problem, you can count on us to have a backup plan in seconds. © 2019 East Coast Prompters, Inc.